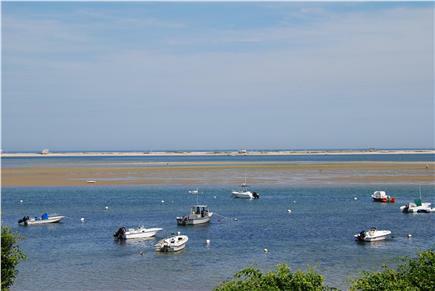 Beachfront With Heated Pool On Chatham Harbor - Paradise! Plenty of cozy seating, favorite spot to drink coffee! See the beautiful full moon rise over North Beach. Incredible! An evening swim in the heated pool or the spa, then s'mores! 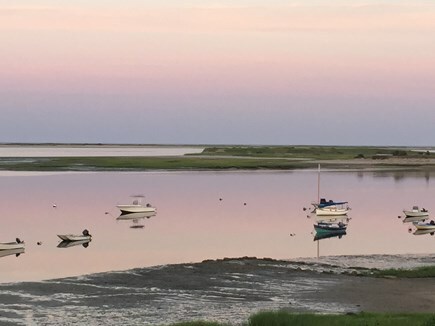 The 180 degree postcard perfect views are known as the absolute best in Chatham. On a private road less than 1 mile from town, go right to the water's edge to breathe in the cool air off the sea. Relax in the 50'x 25' HEATED SWIMMING POOL with new built in spa on a gorgeous bluestone deck with stunning views of Chatham Harbor. Enjoy the enormous wrap around deck and take in the incredible views facing east across North Beach and out to the National Seashore. 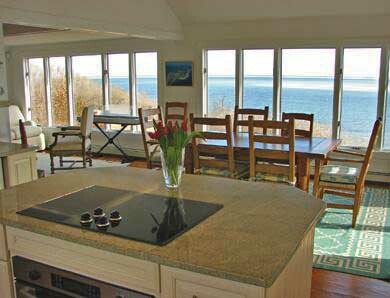 Walk right down the private stone steps to 250' of private beach (with mooring) to walk, swim, kayak, paddle board (2 paddle boards included!) play and sunbathe. 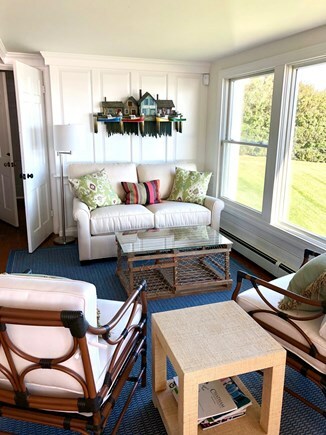 Walk 10 minutes right down the beach directly to the fish pier to pick up your fresh lobster or swordfish dinner, walk 15 minutes to downtown Chatham for the Friday night band concerts or shopping or dinner in town, walk 10 minutes to the large town playground. 2 miles to visit Lighthouse Beach or 1 mile to Oyster Pond (aka Childrens Beach). Ride your bikes over to the beautiful Cape Cod Rail Trail and bike to Harwich or Orleans. It is all right here. Or, you just might never leave the beautiful, easy house. Beautifully renovated with open, family oriented floor plan. 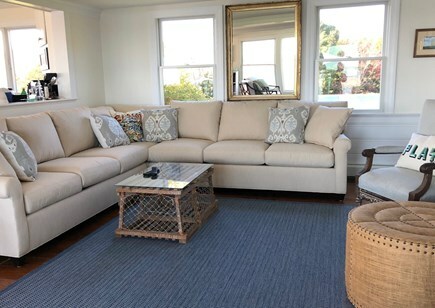 New furniture (2019). Top of the line appliances. Fully renovated. Complete paradise. 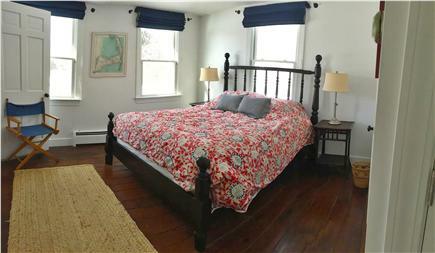 PRICING INCLUDES: All Bed Linens - with beds made upon arrival, Bathing Towels, Beach Towels and Cleaning. 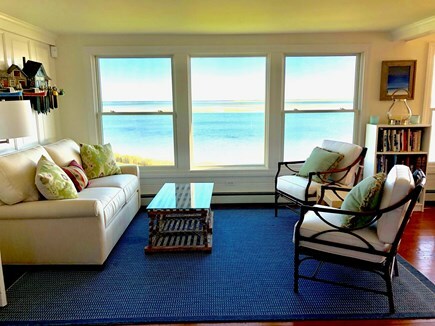 Sleeps 16: Master King on 1st floor with huge windows and stunning views east, south and west over the ocean and down toward the Fish Pier and Lighthouse Beach (sleeps 2). 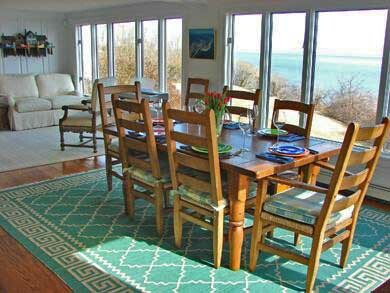 2nd King on 1st floor also with great water views, facing east and south (sleeps 2). Queen on 1st floor facing the pool and the beautiful flowering gardens (sleeps 2). The kids can all go upstairs! 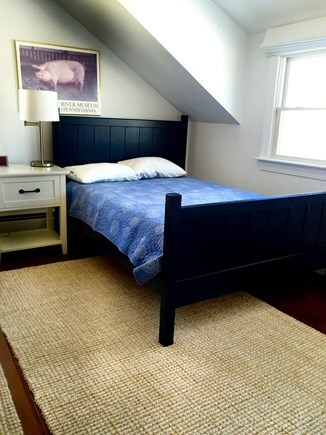 Bunk room with 2 sets of bunk beds and a double overlooking the ocean (sleeps 6). Large outdoor shower, with views to North Beach! Open floor plan, all renovated with new furnishings. Open kitchen with all new appliances and Sub Zero, 2 Miele dishwashers, wine fridge, enormous wrap around deck with sweeping views and professional series Weber propane grill. 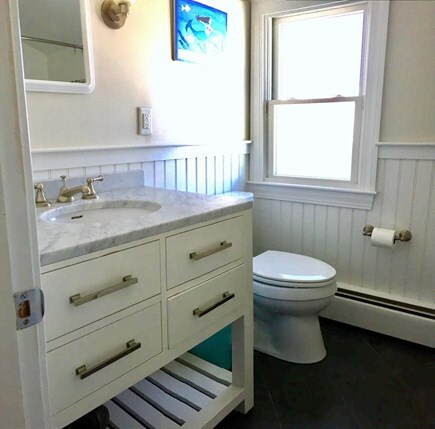 Renovated, updated and sparkling clean bathrooms. 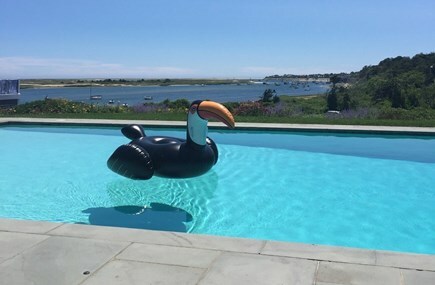 Spectacular heated 50' x 25' Gunite swimming pool with large bluestone deck, facing south and east over the water - amazing views from the pool as well as from the house. Huge new 8 person spa next to the pool. Fire pit. Lots of privacy for your whole family and plenty of outdoor space to play volleyball, baseball, flashlight tag, roast s'mores etc. Hi speed internet, DVD, expanded cable, microwave, 2 dishwashers, games closet, books, puzzles, firepit, propane grill, extra fridge and freezer, new washer/dryer, beautiful Brown Jordan outdoor pool furniture, downstairs walkout rec room withTV, treadmill, ping ping table etc. 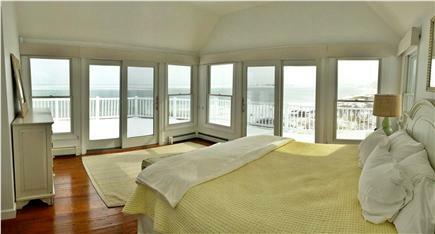 all with ocean views. Plenty of room for all to relax, eat and play, indoors and out! Bring your boat if you like - you can use the mooring right in front of the house to get over to North Beach Island. Or use our kayak or 2 paddle boards to paddle over to Tern Island and see the seals playing in the shallow surf. Walk or bike to town - 15 minute walk - or to the band concert or to the Chatham A's games or to the playground or even up to the Lighthouse. Walk right down the beach - 10 minutes - to the Fish Pier to pick up your fresh dinner caught that very day. Incredible Sunrises to start your days of fun. 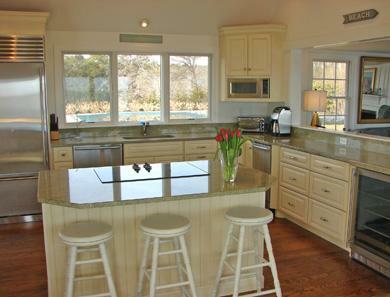 Watch the moon rise over the water as you cook your fresh dinner on the outdoor grill. Take an evening swim in the heated pool or luxuriate in the toasty hot tub. Additional pricing info: Includes all linens, beds made upon arrival, towels, cleaning fees, pool maintenance and pool heat. State and local taxes of 12.45% will apply. My friends and I had an exceptional stay at your vacation home. Even though the weather wasn’t perfect, we were still able to relax and unwind, while enjoying all the house had to offer. The amenities were top-notch and everyone immediately felt at home and comfortable. I speak for everyone when I say we’d be delighted to return. Thank you so much for such a wonderful stay! The views and pool are everything! After renting many houses on the Cape, this is by far the best! This house, the bay, the pool, everything is truly paradise. Fantastic home for a large family! Thanks so much for letting us rent your house in Chatham. We had a "magical week," as my son put it. I can't say how much we enjoyed your comfortable house, beautiful views, superb location, and child-friendly environment. We felt at home instantly. Highlights included clamming, whale watch in Provincetown, Oyster Bay and local beaches, sunset at a rather rainy Skaket Beach, a drink on the Chatham Bar Inn veranda, the pool and hot tub, walks to the fishery (twice), getting fresh fish for dinner, and just sitting on the deck to watch the boats. Our week exceeded expectations and we all concluded that this was "the best house we ever rented." Our family would like to thank you for sharing your home with us. We couldn't have asked for a more beautiful and comfortable place to celebrate a birthday. You have thought of everything to make a stay at your home special........games, books, candles,extra blankets, any utensils/dish that we needed and even the binoculars to see the birds and ships! The view is just spectacular as well. Thank you again for sharing your home-it meant so much to each of us.